In a special outreach titled Space Farm 7, seven of the nation’s top agritourism farms have been selected to celebrate and honor the U.S. space program in collaboration with NASA this fall. 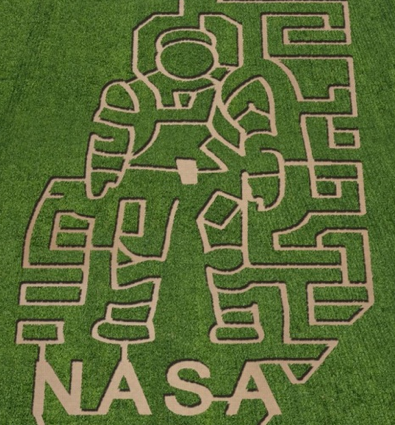 Each farm has planted corn mazes that will feature designs celebrating NASA’s achievements and progress in space. An increasingly popular phenomenon of crop circle-type creations, each of the seven corn mazes will open this fall to challenge and delight visitors. The objective of this outreach project is to expose guests to NASA space exploration and educate children across the United States. The celebration is very timely because this year NASA celebrates the 50th anniversary of the first American in space, the 30th anniversary of the first space shuttle mission, and the 20th anniversary of the Hubble Space Telescope’s deployment in space. Games and activities in the mazes will reinforce the educational missions of the space program so maze-goers can learn and have fun at the same time. Other activities proposed for the farms include traveling space displays, NASA-sponsored activities, and online educational materials. The group also is working together to schedule astronaut visits and to host a national contest where winners earn a visit to NASA’s Kennedy Space Center in Florida and the chance to dine with an astronaut. Visit www.spacefarm7.com and vote on their favorite of the seven maze designs. A winner will be selected randomly at the end of October. Participating farms include Belvedere Plantation in Fredericksburg, Va.; Liberty Ridge Farm in Schaghticoke, N.Y.; The Rock Ranch in Rock, Ga.; Vala’s Pumpkin Patch in Gretna, Neb. ; Dewberry Farm in Brookshire, Texas; Cornbelly’s Corn Maze & Pumpkin Fest in Lehi, Utah; and Dell’Osso Family Farm in Lathrop, Calif. All are associated with The MAiZE Inc., the world’s largest maze design company. To see pictures of the mazes and for more information, visit www.spacefarm7.com. 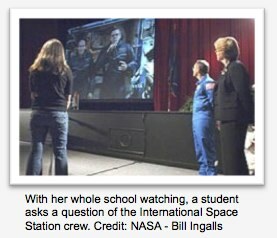 Link to the NASA Explorer Schools Virtual Campus website. NASA Explorer Schools educator Colleen Orman from Norfolk Public Schools has some ideas for ways to kick off science fair projects by incorporating the investigation process during the school’s family nights sessions. Parents and students were guided through the complete experimental design process in a hands-on manner. Students created a straw hoop plane and tested to see if the placement of the hoops affected the distance the plane would fly. Besides having a great deal of fun, both parents and students learned about the steps to create a successful science fair investigation. The activity was an investigational process, which reinforces NES materials. She has used various flight-related investigations to support previous family night events. What a great way to involve parents in their student’s learning! Colleen has logged this entry in the Virtual Campus and is now one step closer to participating in the NES Recognition Program!